NASA has announced that their mission to the watery moon Europa is a go - and this may be the best chance yet to discover alien life in our solar system. NASA's latest mission concept - to investigate Europa, especially with regards to its habitability - has now entered the formulation stage after being approved by the agency's governing body. 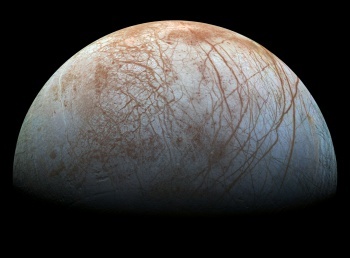 "Europa is the most likely place to find life in our solar system," says Robert Pallardo, a scientist with NASA. "We think there is a liquid water ocean under its surface." When all life as we know it is so closely tied to liquid water, it is hard not to become excited at the possibilities when water is discovered elsewhere in the solar system. Europa is Jupiter's fourth-smallest moon, and was discovered by Galileo - along with its sister satellites Io, Ganymede, and Callisto - in the early 1600s. Though not quite as large as Earth's own Moon, Europa is still one of the largest celestial bodies in the solar system, larger in diameter than any of the dwarf planets. For decades, scientists have wondered if Europa could - or does - harbor life. Carl Sagan was one of the earliest scientists to suggest that the moon possesses a liquid water ocean just under its surface; in Stanley Kubrick and Arthur C. Clarke's 2001: A Space Odyssey, Europa possesses primitive life that is being guided and protected by the monoliths (this did not end up in the film, but later books in the series explored the concept). The recent film Europa Report similarly banks on the concept of there being some kind of life under its icy exterior. One of the most interesting elements of the Europa mission is a fly-by through one of its "plumes." These jets of what we believe to be water occur at predictable intervals - namely, when the moon is furthest from Jupiter - and reach approximately 200km in heigh - or 20 times the altitude of Mount Everest. The Voyager craft will attempt to coast through one of these plumes, "tasting" the water and analyzing its contents. For all the fuss about the mission now being under way, the actual flight will not take place for another decade. Until then, we can only speculate about just what lies beneath Europa's surface. Will there be life? Will it be sentient? Who will be the first person to declare, "that's no moon?"